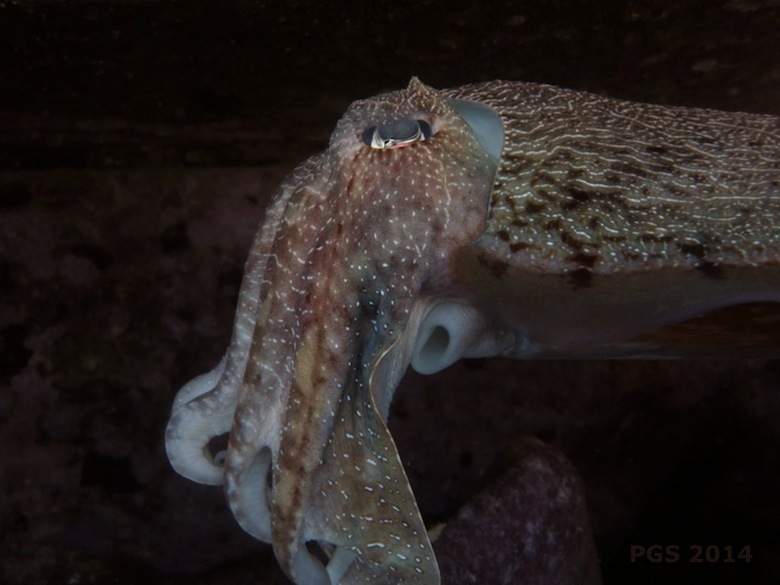 The photos in this post are of the same animal seen in the previous one, all taken as I watched a Giant Cuttlefish produce a long sequence of color changes inside a shallow cave. I’m continuing this theme because a few days after that post, a new article about cephalopod color change came out. 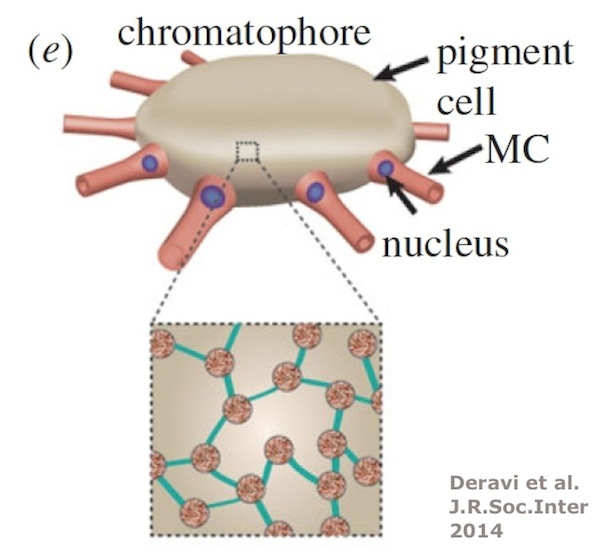 The article, by Leila Deravi and her co-authors, delves into the internal structure of one part of the color-change machinery, the chromatophore. The basics of cephalopod color change work like this. The skin has three layers, as seen in this diagram from the new paper. At the bottom (deepest in the skin) the leucophores reflect all the light that gets to them. The two layers above have a more complicated role. 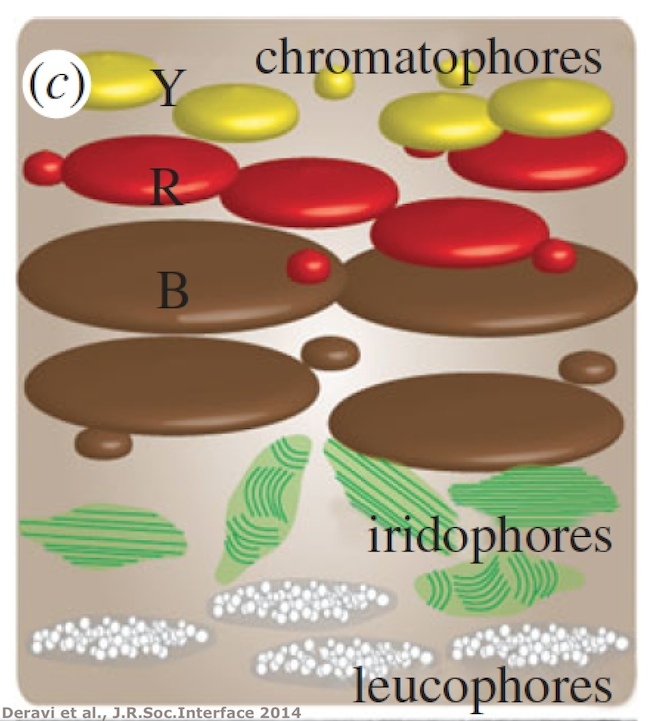 The iridophores are a layer of reflectors and refractors that can modify the color of light, and above them, the chromatophores are the parts that contain pigments, paint-like colors. Those are expanded and contracted – to hide or reveal their color – in a way controlled by the animal’s brain. 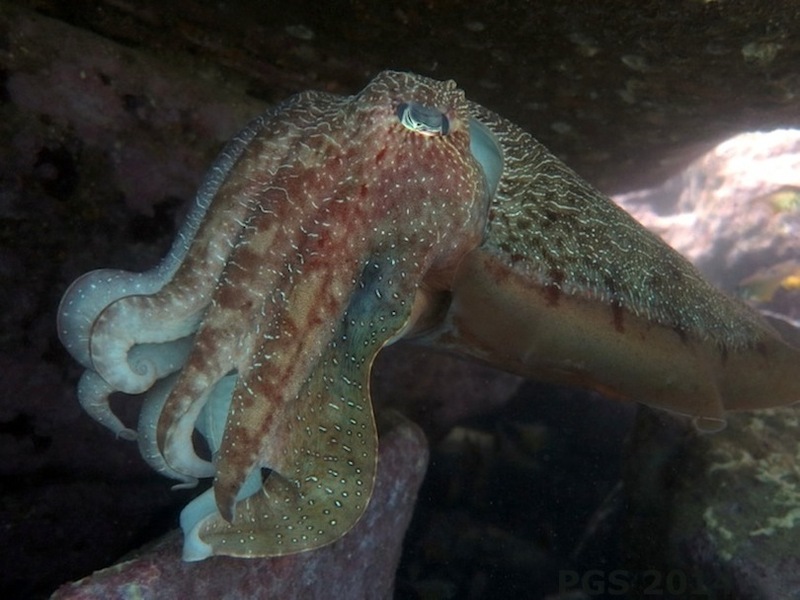 The chromatophores themselves can only produce three colors (as the figure shows), so the full range of colors that a cuttlefish can produce is created through the interaction of pigmented chromatophores and the reflecting layers beneath. What the new paper does is look inside the chromatophores. It does this in a pretty high-tech materials-science way, but here’s what I take to be the message. The chromatophores had previously been seen as no more than bags of colored paint that can be expanded and contracted. But there’s a more complex arrangement inside each chromatophore than had been thought. The pigment granules are held in a network-like structure, along with reflective proteins. The network’s interaction with light changes as its shape is transformed. This enables, for example, a chromatophore to retain its color intensity as it is stretched out by the muscles around it. 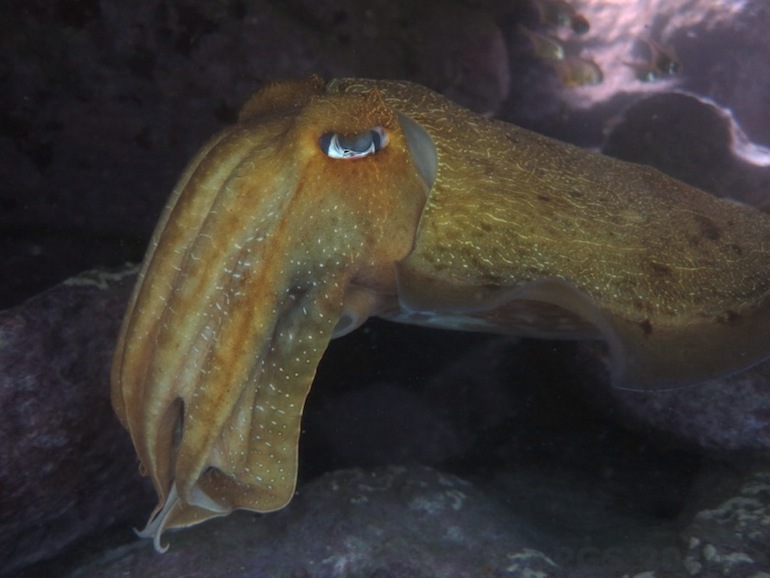 Cephalopod control of color has a “production” side and a sensing and decision-making side. The animal has to decide what colors to produce, and then produce them. This new paper adds quite a bit of detail to what we know about the production side. Everyone is still waiting to learn more about the great mystery on the other side. One thing many cephalopods can do is produce an exact match to the colors around them, for camouflage. They can do this despite being entirely color-blind – or so the standard story holds. I wrote a bit about this puzzle here before and I hope to get back to it soon. A big piece of the color-change puzzle is surely still missing. Notes: The diagrams are from Leila F. Deravi et al., “The structure–function relationships of a natural nanoscale photonic device in cuttlefish chromatophores,” J. R. Soc. Interface 6 April 2014, vol. 11 no. 93.